The Float is a city floating on the sea of an alternate version of Earth. It originated with a rebel armada from an England-like land. The Float is ruled by the Clans, who are descendants of the original ships’ officers. The Family, descendants of the original crews, keeps the Clans in line. To attain that goal, they steal, lie and kill. Jessa Wynn is a member of the Family. When her parents die doing Family business, she is left only with her Uncle Christian. Working by day as a language teacher for the Clans, at night Jessa does missions for the Family. When she learns a secret, the Bookkeeper who is the leader of the Family doesn’t believe her so Jessa decides to find the evidence herself. Oh, and the Bookkeeper speaks to a group of Tom Cats, who also work for the Family. The Family Trade Vol 1 has beautifully different pen, ink and watercolor artwork. It has a steampunky look of the late 1800s but no date is given. The plot moves quickly and offers a few surprising twists. Notably, Jessa is an innovative character for comics. Rarely are female superheroes/adventurers set in a relatively realistic setting, if they exist at all. Jessa is beautiful with her curly dark hair. She is witty, strong and capable but doesn’t always use the most common sense so I assume she is a teenager or young adult. I also love the Toms. They add a different vibe to the series. They act like real cats: self-possessed to the point of superiority (at least in their own minds) but follow orders. Note that I have two cats so I know how unlikely it is that cats would voluntarily follow orders. 4 stars! 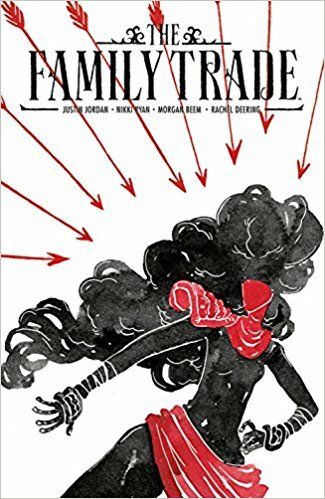 The Family Trade Vol 1 has just begun the story and it is scheduled to be a series. Vol 1 collects issues 1-5. I am looking forward to the future adventures of Jessa and the Toms.